Everything we love can be saved. One way that businesses can implement green projects is to partner with entities offering incentives. Not just government, but also industry — in particular, utilities — have been getting into the act. The Mid-Atlantic has been long overdue for such programs. Constellation Energy (NYSE:CEG) announced February 16 that it will support the development of commercial photovoltaic power systems with a $90 million solar capital commitment. To maximize the value of government renewable incentives, the $90 million set-aside will be available for customer-sited solar installations of 500 kilowatts or larger which begin construction before mid-year 2010. The capital commitment enables Constellation Energy to finance, design, construct and own solar installations for customers and supply the power generated on-site to the customer. This structure makes it possible for customers to deploy on-site solar and meet sustainability goals without incurring upfront costs. Approximately $18 million of the capital commitment has already been committed to projects soon to begin development in Maryland and New Jersey. Constellation Energy has committed to expanding solar project development over the next several years. The company currently has approximately 25 megawatts of solar power systems installed or under way in the U.S., ranging from customer-sited rooftop installations to a 17.1-megawatt large-scale project in Emmitsburg, Md., that will be among the largest in the U.S.
Constellation Energy has developed photovoltaic installations for retailers, manufacturers, government facilities and universities nationwide, with a focus on projects in Maryland, New Jersey, Massachusetts, Pennsylvania and California where solar incentives and credits make development particularly attractive for customers financially. Solar renewable energy credits (SREC), which are granted to solar projects for every megawatt-hour of electricity produced, help make on site solar projects economically attractive. With SREC values scheduled to decline over time as states require the development of more solar generation, the next several months represent the optimal time to begin construction of on-site solar with the strongest project economics. Structured correctly, today’s photovoltaic power systems can generate electricity that is priced at or below the cost of power from the grid. Qualifying projects of 500 kilowatts generally require at least 100,000 square feet of roof space or two acres of open ground. 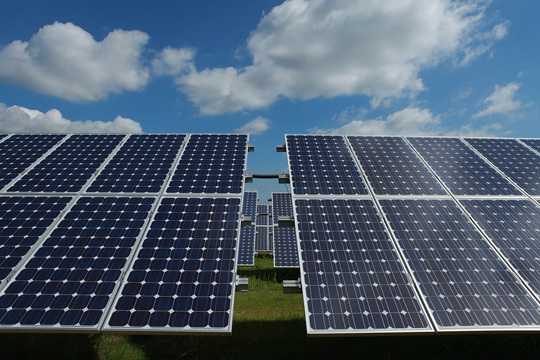 Organizations interested in developing solar projects can contact Constellation Energy at Sustainable-Solutions(at)constellation.com or 1-877-427-2005.